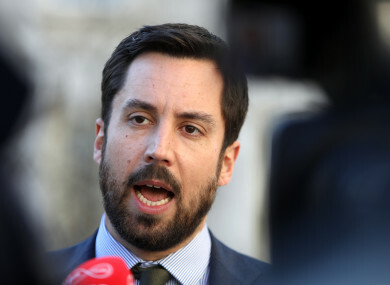 CALLS HAVE BEEN made for Housing Minister Eoghan Murphy to resign as the latest homeless figure show that there are just under 10,000 people living in emergency accommodation in Ireland. “This is Eoghan Murphy’s record as Minister, ever increasing levels of adult and child homelessness,” he said. Figures released by the Department of Housing yesterday show that there were 6,157 adults and 3,811 children homeless and living in state-funded emergency accommodation in Ireland. The numbers show an overall increase of 158 adults and 86 children across the country. Commenting on the release of the figures, Minister Murphy said that it was “very disappointing to see more children in emergency accommodation as we enter into Christmas week”. The department pointed to the fact that the number of homeless families in Dublin had decreased for the fourth month in a row. The number of homeless families in Dublin decreased by one, but the number of homeless children increase by 16. The government has been widely criticised for its handling of the homeless and housing crisis which has been a feature of the country for the last number of years. “It is totally unacceptable that at the same time one child became homeless every 4 hours in November in Dublin alone,” said Focus Ireland CEO Pat Dennigan on the release of the figures. “Nobody thinks this is acceptable and people on all sides offer sympathies but we need more than that. “We need greater action and must not to tolerate the fact that nearly 4,000 children are homeless in our society. Anthony Flynn – CEO of Inner City helping Homeless – said the government had “continuously failed” children. “As we come towards the end of 2018 it is clear that the homelessness and housing crisis continues to get worse while the government continue to fail people when they need it the most,” he said. Email “'Do the decent thing and resign': Murphy blasted as homeless numbers almost hit 10,000”. Feedback on “'Do the decent thing and resign': Murphy blasted as homeless numbers almost hit 10,000”.